A young enthusiastic millennial Aashnee Gajaria is always brimming with energy to take up new challenges but at the same time is cognizant of her responsibilities. She holds a Bachelor’s Degree in Management Studies from H.R College of Commerce and Economics and a Master’s Degree in Marketing, Strategy, and Innovations from Cass Business School, City University of London. After giving about three years to the corporate world with her stint at DDB Mudra Group Mumbai gaining relevant communication experience, Aashnee decided to go to London for her further studies. On returning, Aashnee turned down her dream job at one of the world’s biggest FMCG companies. Because she knew that she’d found her calling in helping children with incurable disorders. 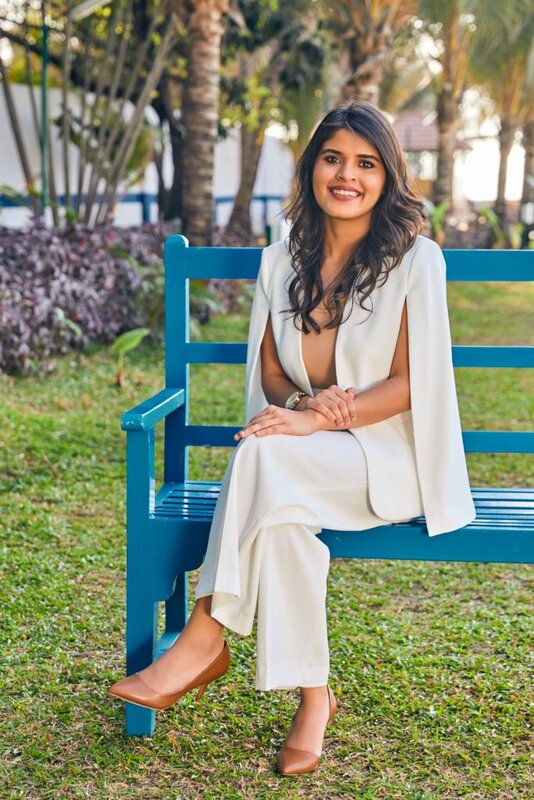 Today, she and her mother Neeta are proud founders of Meditourz – a medical tourism company which they started in 2017. The company ensures safe, affordable and quality medical care to patients that ensures your pre and post-treatment is completely hassle-free. With a philanthropic background at home and my own altruistic beliefs, I was drawn to work for the welfare of the society at a very young age and joined Rotaract Club in my early college days. My deep involvement and effective execution of social projects made me earn awards like ‘Most Promising Leader’, ‘Best Organizer’, and ‘Outstanding Contribution’ acknowledging my initiatives, contributions, and competence. A lot of social work goes hand in hand with the medical world, hence I forayed into the medical world with a stint at Johnson & Johnson Medical India. My assignment required me to do market research for one of their distinctive product 'Evicel' which had been successfully launched in the USA and the company was looking to launch in India. My prior experience empowered me to interact confidently with a huge set of company’s patrons and top doctors to gather valuable information for the company. Another feather in the cap for me was launching a communication campaign for Green Light Planet, a for-profit social brand specialized in providing Solar Lamps to rural India which is not always connected to the power grid. I had contributed immensely to the communication campaign with innovative ideas and impeccable execution to drive the campaign. It is no mean achievement that the brand has reached 5,025,695 homes and the installed 98,09,268 solar lamps that are lighting up mind blowing number of rural homes with brightness and hope. When and how did the idea of Meditourz come into being? It all started when we read an article in the Guardian about a family in Dhaka, where the father was pleading with the Bangladeshi government to allow mercy killing of three of his children, as they were suffering from Muscular Dystrophy and had no funds to help them improve any longer. On further reading, we realized that the statistics for neurological disorders in children are quite disheartening. 1 in 59 children is diagnosed with autism in the world. The lack of formal training in medicine did not hold us back. With a single-minded vision to create value in the lives of special need children, we partnered with one of India’s top neurosurgeons who’s a pioneer in Autologous Stem Cell Therapy and Neuro-Rehabilitation. Our main motive was to help create awareness amongst patients facing incurable neurological conditions like Autism, Muscular Dystrophy and Cerebral Palsy, that there was now a solution and the promise of a better life, even if not a complete cure. How has been the journey of Meditourz so far? It’s been amazing. We have touched the lives of more than 1000 patients all over the world in just 2 years and have held more than 15 conferences in Asia, South East Asia, and the Gulf. Since you lacked formal training in the field of medicine, what challenges did you face during the journey of Meditourz? Health and medicine are a very sensitive field. We realized that unlike any other field we actually have to put ourselves in the shoes of the parents. These parents go through a lot while handling special need children and it is important to understand their perspective and needs patiently with compassion and empathy. Not only that they come from culturally very different backgrounds. In some countries, we have realized parents feel special need children are a gift of God and they should be accepted the way they are, while in other countries they consider them a burden and keep them away from the regular happenings of the society. There are also a lot of language barriers as we deal with International markets where English is not the first language. Also since our offering is very new and niche it is important we offer a good enough service with a strong backing of parent testimonials and research. That being said any new treatment or therapy have their fair share of opinions. Some for them and some against them but we believe that what we are offering is the way forward in medicine and health and work keeping that in mind. A lot of times people are scared about doing medical treatments in a foreign country instead of their home country. Therefore, it is also important to assure them that not only is the treatment safe and good quality but also that the doctor is genuine with a good offering ensuring their pre and post treatments are completely hassle-free. How do you source and manage funds to treat underprivileged patients? We try to ensure our tie-ups and connections are solid and the cases we take up are genuine. We do things right everything falls into place as we are making a difference. There are also a lot of people out there ready to help such cases and people wanting to make a difference. How are you helping children with incurable disorders? Is the government playing its part in helping them? By creating as much awareness as possible. I think it is important to make people aware of not only the problem but also of the advancements in the medical field that solve them. People need to start being aware and accepting that these problems exist and the government should help in creating awareness as well. Its just been in the recent years that people are being more open to Mental illness as well. I am aware that the central government has a 'Pradhan Mantri Yojana' where people with disabilities are given financial relief for treatments in government hospitals which is a great initiative. What helped you to stay motivated and continue your way towards your dream? The fact that I was making a difference. The best feeling was to see parents happy. The joy you get helping others is the biggest motivation and reward. Stories shared by the parents about their children’s improvements always made me realize my purpose and my end goal. The world is our oyster. We want to create awareness of regenerative treatments and therapies in different parts of the world and in different fields reaching as many people as possible and making a difference. What is your advice to women, who want to make a difference but hesitate? That we live one life. Make an impact, make a difference...people will value you and appreciate you more. If you don’t, you will regret it later. Don’t get bogged down with what people, the society or the world is saying. Do you have any thoughts to share with our readers? Empower People and Progress. We live in a world with different people that have different skill sets. It's important to gain and learn from them and also share what you have learned. In this way. you are not just helping yourself but also others. There is nothing we are losing by learning and teaching. Let's all make a difference and create an impact together in different walks of life. PREVIOUS POST Previous post: Superstition in Menstruation: let it go – get up, grow!